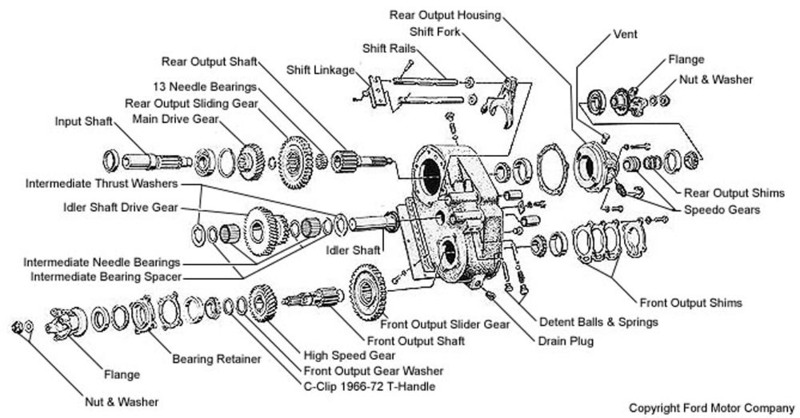 The heart of your 4x4 is it's Transfer case. This is what makes a 4x4 a 4x4. 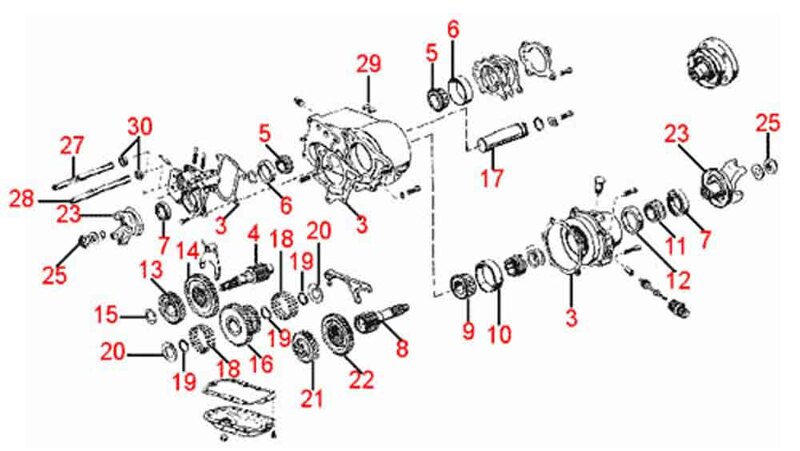 Obviously it's a critical component - the Transfer case, as much as any other component, if not more, defines the characteristics of your rig - be it gearing, strength, or front/rear drive options. So naturally, you want the best. Ahhh....if life were only that simple. If it were just a case of wanting the best...then everybody would just run an Atlas, the famed low-range, twin-stick, all gear, super-strong, yet light and short transfer case from Advance Adapters. 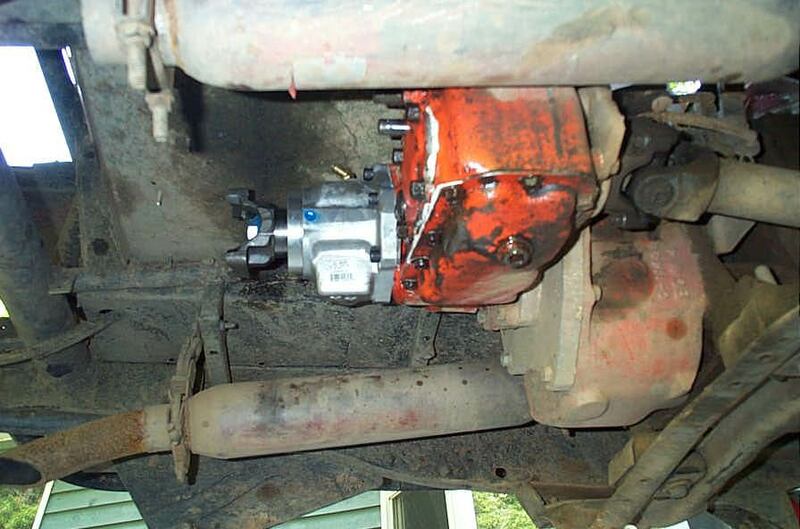 Sure, some would run over or under-drives before it, some would use "doublers", but I don't think there is any argument that the single best 4x4 transfer case available is the Atlas. And then, for many of us, the harsh reality of real-life intrudes. As always, the best comes with a price. The Atlas Transfer case normally retails for better than $2000.00 U.S. - a fair price no doubt, judging by it's enormous popularity and legendary status.....but simply out of reach for many of us. It's not just the bottom line, it's the requirement to come up with the $$ all at once. For me, working father of 2, dog, mortgage, car payments, and a serious 4x4 addiction - it's not about the bottom line, it's about the real life, week-to-week, month-to-month cash flow realities of life. And that's exactly why I have set out to undertake this project - to build a transfer case equal to the Atlas, but in stages, as I can afford it, bit by bit. In the end, I expect to have as much invested in my Uber-20 as an Atlas costs. This doesn't bother me a bit - for I know the reality is, there's no way I could scrimp and save long enough to buy an Atlas in one shot - I need to spend, I need to build, and I need to wheel. It will all be worth it, IF the end result is a quality unit. I think it can and will be. Follow along - see what it takes, and see what the results are. .........and there you have it, a bulletproof, low gear twin-sticked little beauty, with the added advantage of the pride in having spec'd and built it at home. The Plan, Step 1 - The raw material. There are a few options here. Dana 18, Dana 20, Dana 300, and NP205 are the most likely candidates. The NP205 is a great case, no doubt, but it has it's flaws that make it unacceptable for my project - namely it's huge, heavy, and as of now, there are no low gear sets available. Strike 1 from the list. The dana 18 is a fine case, but a little old and quirky. Because of it's indirect rear drive it can be noisy and prone to wear, there are different versions - some much less desirable, and it has no distinct advantages - so it's out too. That leaves the Dana 20 and Dana 300. Both are all gear, cast iron cases, have similar weak points, can be twin-sticked, have low-gears available, and are relatively compact. The dana 300 has a better stock low-range, 2.62:1 compared to the Dana 20's 2.0:1, and its probably for this reason that they generally command higher value than the 20s. In the end, I went with a 1979 Jeep CJ Dana 20. 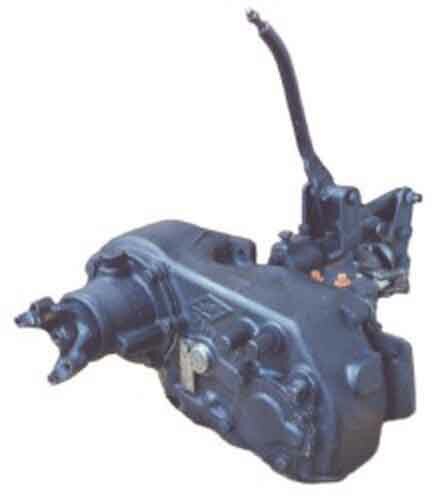 The Jeep Dana/Spicer model 20 transfer Case is a compact all-gear, iron cased unit. It has a direct drive, centered rear output, and a front output on the passenger side. It has a 4" locating bore for the rear output, can be easily twin-sticked, and comes with a stock 2:1 low range. It's only real weakness is the small, coarse-splined rear output shaft (1-1/8" 10 spline). The rather measly 2:1 low range isn't great either. My stock Jeep Dana 20 from a 1979 CJ-7. The Plan, Step 2 - upgrading the weak stock output. Enter Advance Adapters heavy Duty Dana 20 1-3/8" 32 Spline Output Shaft Kit. This kit is a godsend for all Dana 20 owners. It upgrades the only real weakness of the Dana 20. Read my full installation / product review article HERE. All I need repeat here, is that in one easy step (installation takes all of 30 minutes) I have completely taken care of steps 2 and 3 of the plan. I have upgraded the weak-point of the case, gaining approximately 50% greater strength and the ability to hang from my Dana 20 the Famed 1 ton 1350 series High Angle CV driveshaft from High Angle Driveline. As an added bonus - I may even run a speedo in the Wolf now, as the AA D20 Output kit includes a custom machined housing that accepts stock Jeep multi-tooth speedo cable drive gears - so it's easy to both run a speedo, and calibrate it for whatever tires/gears combo you are running! Sweet! 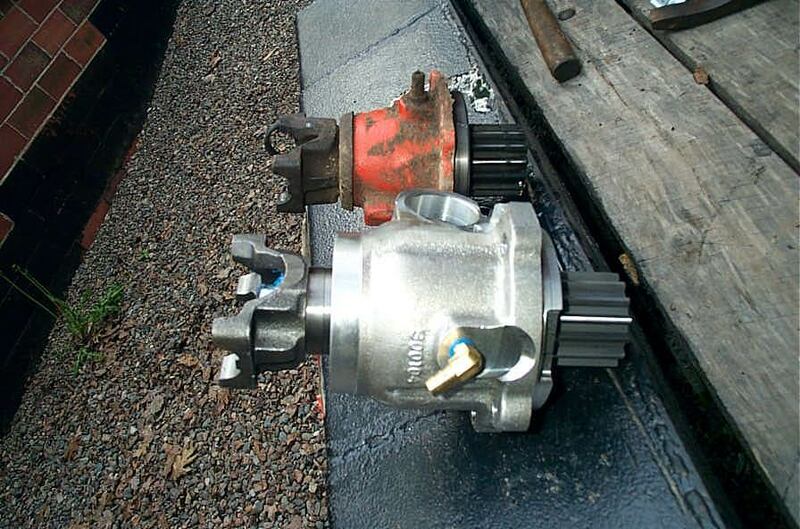 The Advance Adapters 32 spline output kit, compared to the stock 10 spline unit. My Dana 20 with the AA 32 Spline HD Output installed. The Plan, Step 3 - adding a 1350 series, 1 ton CV rear driveshaft. 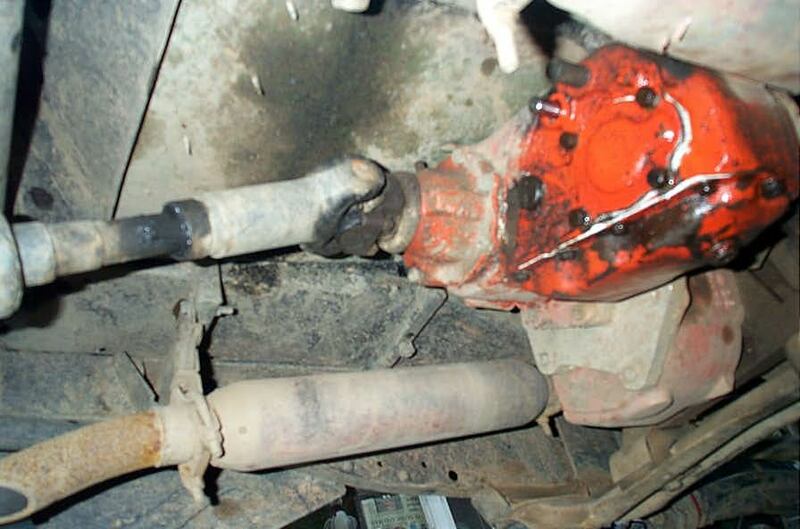 Read my complete tech article / product review on the install of a High Angle Driveline 1 Ton CV driveshaft HERE. The Plan, Step 4 - gearing it low. Read my complete tech article / product review on the install of a Tera manufacturing 3.15:1 low range kit HERE.